Posted February 4, 2016 by ReceivableSavvy. Atlanta, GA, February 4, 2016 (Newswire.com) – Receivable Savvy today published its free Best Practice Insight: How to Reduce DSO for Your Organization, a comprehensive, 21-page eBook designed to help organizations understand and implement DSO-reduction practices to ensure they get paid faster. 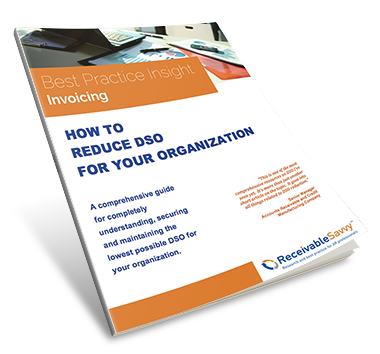 How to Reduce DSO for Your Organization is the first in a series of Order-to-Cash Best PracticeeBooks Receivable Savvy will publish throughout the year.